You WILL Master Advanced Statistics in Excel ! Are You Struggling To Master a Difficult Statistics Course? With the help of Mark's book, and some diligent studying, I received an A in my stats course. "The Excel Statistical Master really saved me in my graduate statistics class last semester. The book that was used in the class really did not give the practical down to earth instructions I needed to apply my statistical knowledge to excel. In this quide I was able to find helpful step by step instructions (and pictures) that walked me through creating ANOVA's, Hypothesis testing, and so much more. I highly recommend this book for graduate students and managers who are looking to maximize the power of Excel in their daily operational activities." "Faced with a seemingly intractable spreadsheet assignment for my online Operational Research course at a UK university and very little time, my purchase of this book could not have come at a better time. With clear steps to follow, mastering the Statistical 'matter' and being able to apply them with Microsoft Excel assisted a great deal and broke down the 'hard nuts' in my spreadsheet assignment quickly. I recommend this book if you are afraid of 'statistics'. It'll definitely drive those fears far away." "Currently I am teaching MBA courses at New York and I must say, I really like the Excel Statistical Master. It is incredibly useful. The explanations and videos in the manual are excellent. If you're a student of business statistics, this e-manual is worth WAY more it's priced. My students that I have referred to this manual told me that it really helped with several courses. My students all stated, and I agree, that the explanations are clear and easy-to-follow, and the manual is comprehensive." "I am a medical student at Semmelweis University in Budapest and the Excel Statistical Master helped me so much with passing my midterms and my semifinal exam. There is no way I would have passed without it. "I am a recent MBA student from a top 10 business school in the US. I bought this product to supplement by knowledge about Statistics and haven't regretted about the decision. The book is an excellent source of easy to understand material. The videos have helped me immensely in my advanced marketing classes such as pricing and data driven marketing. I highly recommend it to any current student or a working professional as a one stop shop for stats." Do you know how many students drop out of Stats with Excel courses because of the enormity of the course? And none of the teachuhow excel online courses ever cover the extent of stats needed. This is great to know someone is out there to help the MBAs. "At first I was quite skeptical of this book and the attendant Microsoft Excel spreadsheets. Everyone touts how easy their product is and how you really "need" their product to be successful. For one of the few times I can remember, that claim is fulfilled with this product. I have been using Excel since the product first came out on the Macintosh. But the Excel Master series has shown me how really limited my knowledge was and how much there is yet to learn. The Excel Master series is certainly an enjoyable and well constructed method of learning statistics. The quality of the author's effort to reduce a relatively boring subject to easily understood examples and text is evident throughout. I highly recommend this series to anyone interested in the application of statistics to everyday problems using to most powerful computer environment available." "Whenever I evaluate a book on statistics, I always look at the table of contents to check both the topics covered and the examples. Not only does the author cover all of the techniques you're likely to need in a graduate program, he also goes into substantial detail on when to use each technique. I also found that his case studies and focused examples, all of which are listed in the detailed table of contents, were on point and good learning tools that will help learners know when and how to apply the techniques. His explanations, particularly on when (and how) to use two-tailed tests for hypothesis testing and the Poisson and exponential distributions, were clear and will help anyone learn how to implement these techniques. In particular, this book will help anyone without a substantial background in math, such as many political science M.A. students, to learn and apply the concepts. Practical and Clear Graduate Statistics in Excel is very well done and well worth your money." "I'm a Statistician with more than 25 years of field work, at the same time I'm probably the top MS Excel expert in the Middle East. Excel now is a Universal tool and an absolute must for those wishing to understand practical Statistics and applying Statistics to a very large percentage of real life situations. All of the above facts require a clear understanding of the statistical features and capabilities of Excel. What is needed is a guide that takes you to the point DIRECTLY. As an Instructor Mr. Harmon's excellent work saves me considerable time, and should help all students. And as a quick and direct revision tool for those applying Statistics in Business, Insurance, Medical Decision making and many more situations. Thank you very much Mr. Harmon." "This book (and associated optional video material) allows people with only very basic statistics knowledge to apply useful statistical analysis in MS/Excel by explaining the concept, introducing examples, showing how to use formulas in those examples and even calculating by hand some of the statistical values you would only normally obtain by using an excel function (without regards on how the values are actually obtained). This is a small investment that could provide you with good possibilities to advance both in school and in your professional life. If you are looking for an easy way to use statistical analysis this is a right investment. Also the author is willing to answer questions if you ever have one, though I confess I've never asked anything." "I originally found this series on the author's website while searching for a intro guide to statistics using Excel. As an engineering major in college, I never took statistics. Now that I am a practicing engineer, statistics is an important part of my job - from reviewing test data to designing experiments and performing ANOVA. The Excel Statistical Master series has helped me get up to speed faster than any traditional textbook. I also found that my technical reports are more polished and professional as a result of my study of this material. The lessons are organized into logical groupings of topics and are just the right size for self-study or if you are using it as a course supplement. Once I had mastered some of the basic topics I was able to skip around and study those topics I needed for my work. The ability to follow along with the exercises in Excel and then test out new scenarios is a real bonus and a great way to gain a feel for some of the concepts. Since most of my work is done with Excel anyway, the exercises have served as templates for my job. I highly recommend this series to anyone who works with statistics and also to the professional who desires to have a nicely organized reference for performing statistical calculations in Excel." "I use this book as a reference to insure I work a problem in the correct manner. I am not a statistician but I need to apply statistics from time to time. I don't remember if for a given situation I need to do a 2 tail test or a single tail test. Or if the probability in a situation is of normal or binomial nature. This book is structured around examples (at least one for each single application of statistics covered in book)and the detailed way to work each one step by step. Each step explains the theory behind it, what formulas to use and why, what assumptions to make or not make, and how to interpret the results. It is easy to find an example that fits your particular problem. Following the example allows you to work out your own problem correctly. Doing it in excel allows you to present your problem, calculations, result and interpretation in a professional manner. It is the best statistics reference I have seen so far and it is well worth the money." Absolute, Immediate, No-Questions-Asked, Money-Back Guarantee If Not TOTALLY, 100%, Not Just Satisfied, But DELIGHTED that the Excel Statistical Master is BY FAR the Easiest and Fastest Way To Master an Advanced, Graduate-Level Course of Statistical Problem-Solving Techniques and Frameworks AND Be Able To Do It All With The Program That You Know Well - Excel. ►Build a Better Split-Tester in Excel Than the Well-Known Google Web Site Optimizer. 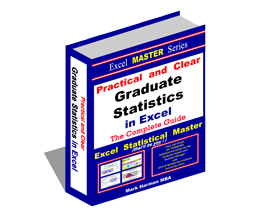 Complete and practical yet easy-to-understand graduate-level statistics course with all of the problems worked out in Excel. Thoroughly covers all topics of an intense graduate statistics course using nothing but step-by-step, simple explanations. Loaded with completed, real-world problems all in Excel, this e-manual is an outstanding supplement to a graduate statistics course. Very clear explanations are used to show exactly how the Excel formulas integrate with the statistical frameworks being applied. The reader will learn how to master and apply graduate-level statistics much faster than a student in a normal graduate statistics course because this e-manual’s emphasis is entirely on problem solving, not on useless, forgettable theory that fills up many statistics courses. This e-manual achieves two goals: teaching graduate-level statistical frameworks in an easy-to-understand way and then showing how to implement all of it in Excel. The widely-used Microsoft Excel program provides a very simple but incredibly complete platform to perform heavy-duty, advanced statistical analysis. All other statistical software packages, such as Minitab, SyStat, and SPSS, are expensive, require lots of user training, and expect that the user is an expert statistician right from the start. Not this e-manual nor Microsoft Excel. The ability to perform graduate-level statistics in Excel is an extremely useful and powerful tool for any graduate statistics student and business manager. The statistics student will greatly appreciate never again having to look up and figure out complicated statistical charts. Homework assignments can be quickly checked with Excel. Once difficult statistical business problems are now readily solvable in Excel. The easy-to-follow frameworks in this e-manual can be cleanly and swiftly duplicated in the real world and on statistics exams by hand (without Excel) right away. The lessons are all in bite-size chunks that are quickly absorbed for immediate use. More than half of the lessons in this e-manual are supplemented with step-by-step videos for more convenient learning. Some of the major topics covered in detail include regression, ANOVA, hypothesis tests, confidence intervals, combinations, permutations, correlation, covariance, t-tests, histograms, and charting. The following distributions are explained with real-world applications using lots of solved problems: Normal distribution, t distribution, Binomial distribution, f distribution, Chi-Square distribution, Weibull distribution, Poisson distribution, Exponential distribution, Uniform distribution, Beta distribution, Gamma distribution, Hypergeometric distribution, and Multinomial distribution. This e-manual also contains two complete chapters with numerous videos showing exactly how to create user-interactive graphs of the above distributions in Excel. These user-interactive Excel graphs allow the user to vary the cells containing all of the distribution’s parameters, such as mean, standard deviation, and degrees of freedom, and watch the graphed distribution instantly change right on the spreadsheet to conform to the new parameters. This is an excellent and unique tool to fully grasp the functionality of the distributions discussed in this e-manual. All problem-solving techniques are presented as step-by-step frameworks that can be readily applied to similar problems, not as seemingly unrelated and difficult-to-apply statistical theorems like most statistics course do. A number of problem-solving techniques are presented in this e-manual that do not appear in any other statistical text. One example of a statistical technique presented only in this e-manual and nowhere else is a detailed description showing how to solve every type of hypothesis test using the same four steps. A number of widely-used and complicated statistical tests, such as the chi-square independence test, the chi-square population variance test, and conjoint analysis using dummy variable regression are described from top to bottom and also in Excel. Graduate statistics students and business managers will find this e-manual to be, by far, the easiest and fastest way to master graduate-level statistics and to apply advanced statistics in Excel to solve difficult, real-world problems, homework assignments, and exam questions. The reader of this e-manual will quickly become an Excel Statistical Master. ►You Already Know Excel. NO NEW SOFTWARE NECESSARY .. You Don't Need SPSS, SAS, Systat, or Minitab.